Many students think that Native Americans only appear in the pages of their textbooks and no longer exist. They believe that all Indians hunted buffalo and lived in teepees. 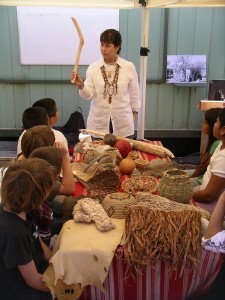 It is the goal of the NATIVE TALK program to promote the students’ awareness of the unique history, culture, lifestyle, and contributions of California native people. The students will also understand that Indians still live in our local communities in modern times, while preserving native culture, traditions, and languages. The NATIVE TALK presentations meet California State Standards in Language Arts and Social Studies across K-6 grade levels. Presentations also meet a variety of Common Core State Standards in English Language Arts and History/Social Studies. See www.cde.ca.gov for a complete list.